If you work in an office and have ever stayed past 5 o’clock on a Friday, you know the feeling—your neck starts to stiffen, your joints start to tighten, and your back starts to ache. They’re all symptoms of a long day spent in an unergonomic work environment. Ergonomics isn’t simply the positive effect of healthy office furniture. 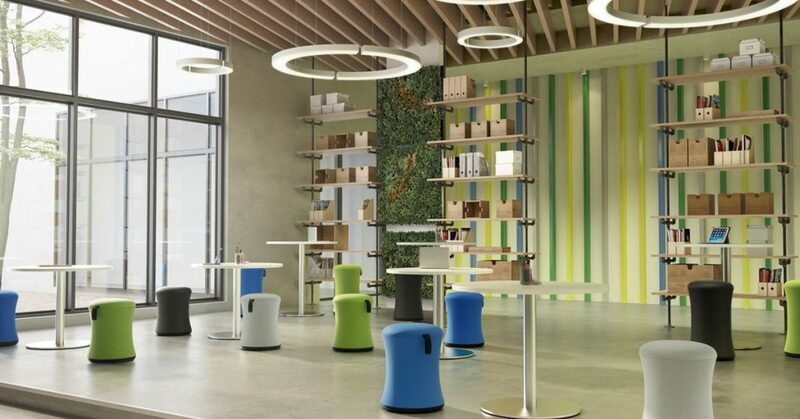 Rather, it’s the overall impact certain types of furniture have on the way you work. Separating the ergonomics of office furniture from the office furniture itself can be confusing, but hopefully, these frequently asked questions might provide some answers. Think of ergonomics as the science of creating the perfect work space. Ergonomics looks at how objects can make you more productive and healthier when completing the repetitive daily demands of work and life. When did the movement toward ergonomics start? The study of ergonomics is nothing new, in fact, it traces its origins back to a scholar in late 19th century Poland. The modern study of ergonomics took off in the 1950s and has helped raise awareness to the importance of creating environments that optimize our well-being and performance. It is now an internationally recognized science. Why should I be concerned about ergonomics? In a workplace where insufficient attention has been paid to ergonomics, the daily demands of the job can leave workers feeling less than stellar. Studies have shown that workers with sedentary jobs and a lack of ergonomic workstations have a greater risk of carpal tunnel syndrome, tendonitis, chronic back pain and more. Ergonomics strives to eliminate uncomfortable positions that lead to the risk of workplace injuries. A little focus on ergonomics in the workplace can go a long way toward maintaining a workforce with fewer injuries and more overall productivity. Are there different types of ergonomics? Yes. Ergonomics looks to improve any areas of life where tasks are repeated daily. The area of cognitive ergonomics, for example, focuses on how our minds interact with elements in daily systems. This particular area of ergonomics impacts decision making, relatability, and individual mental workloads. Organizational ergonomics, meanwhile, strives to create better systems and policies to ease stressors. No matter your field, improved ergonomics in physical, mental, or organizational areas can make you more productive and less prone to burn-out. How can I create an ergonomic work environment? It’s important to look at ergonomic stressors when assessing your space. Stressors include repetitive motions, fixed or awkward postures, and tasks that take substantial amounts of force. Do any of these stressors ring a bell? Making a list of your ergonomic stressors will help you focus on what areas are key to minimizing, or ideally, eliminating them altogether. Watch for common stressors like typing, sitting or texting, and be sure to also examine the tools and lighting used in your space. The first step to improving the ergonomics of the spaces you inhabit is recognizing which objects and tasks impact you daily. For a list of guidelines for specific job types, check out OSHA’s recommendations. Once you have identified your stressors, it is easy to create an ergonomic office environment that is surprisingly comfortable for your lifestyle. At Nolt’s, we love helping our customers build ergonomic environments that increase productivity and reduce work-related pain. Stop by our showroom and let us help you design the perfect ergonomic workspace for your lifestyle.